with powerful and straight-to-the-heart messages on the inside. Grief is not a sign of weakness. It is a sign of the strength of your love. With deepest sympathy on your loss. No daughter could have loved her mother more. With sympathy on the loss of your beloved mother. In the story of my life, you’re in all the best parts! reasons for my happiness. I forget what the other 9 are. 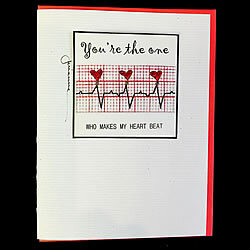 You're the one who makes my heart beat.